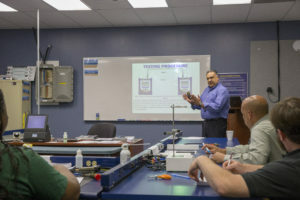 As of January 1, 2018, NAVSEA certification is mandatory training for any person that is currently or has the potential to perform Navy Shipboard fiber optics installation. Click on the links below for our training schedules east and west coast, registration and our informative brochure. All our trainers are certified and approved by NAVSEA. KITCO can train your people in YOUR facilities! Call us at (866) 643-5220 to schedule your class now!